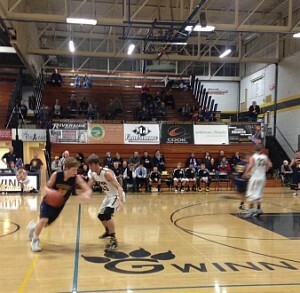 Gwinn, Michigan December 22nd, 2015 – The Negaunee Miners Boys Basketball team traveled to Gwinn, Michigan tonight to face the Gwinn Modeltowners. Jesse Anderson was there to bring you all the action from the U.P. Propane Press Box on Sunny.FM. The Gwinn Modeltowners won the tip, but the Negaunee Miners scored first to take the early lead 2-0. The first quarter was nearly half over and the Gwinn Modeltowners took the lead from the Negaunee Miners 6-4 with two 3 point shots. The Negaunee Miners and the Gwinn Modeltowners both struggled offensively early in the first quarter, but the Negaunee Miners found their fire in the last minute of the game with 11 point run and led 21-8 at the end of the first. The Negaunee Miners started the second quarter with some early baskets to deepen their lead 27-8 over the Modeltowners. The Negaunee Miners did good defensively in the second quarter and held the Modeltowners to only 2 points and led 31-10 with quarter half over. The Negaunee Miners ended the first half with a sizable lead 41-11 over the Gwinn Modeltowners. The Negaunee Miners came out scoring in the second half and led 45-13 over the Gwinn Modeltowners. The Gwinn Modeltowners out scored the Negaunee Miners early in the third to trail 47-19. The Modeltowners continue to put pressure on the Miners, but the Negaunee Miners maintained the lead 53-25 to end the third quarter on Sunny.FM. The Negaunee Miners continued to dominate in the fourth quarter and easily won the game 63-34 over the Gwinn Modeltowners. Join Jesse Anderson on Tuesday December 29th, 2015 when the Negaunee Miners Boys Basketball team host the Manistique Emeralds. The Honor Credit Union Pre-game Show will start around 5:30pm and the game will follow at 6:00pm on Sunny.FM.